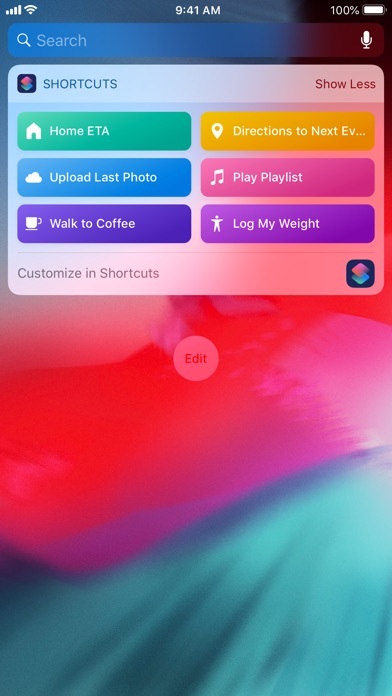 Siri Shortcuts deliver a quick way to get things done with your apps with just a tap or by asking Siri. The Shortcuts app enables you to create personal shortcuts with multiple steps from your favorite apps. Start from hundreds of examples in the Gallery or drag and drop to create your own. 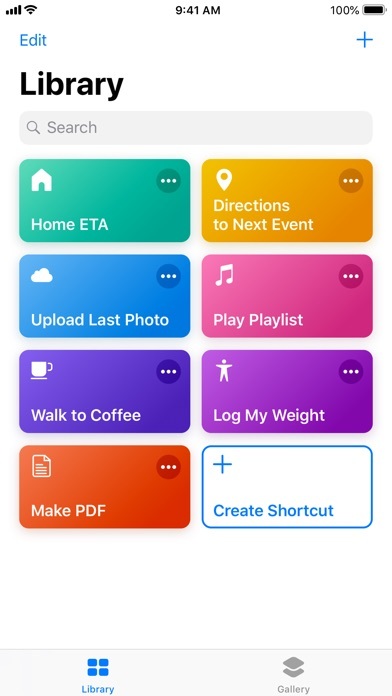 Shortcuts includes over 300 built-in actions and works with many of your favorite apps including Contacts, Calendar, Maps, Music, Photos, Camera, Reminders, Safari, Health as well as any app that supports Siri Shortcuts. 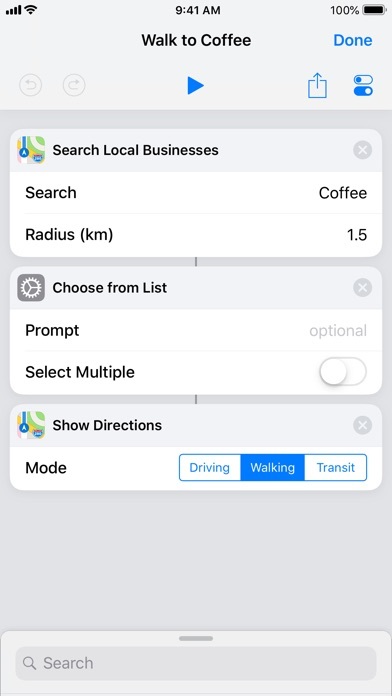 Use the Shortcuts app to: * Get directions home, send your ETA and start listening to the news, just by asking Siri * Add a home screen icon that calls a loved one * Make animated GIFs * Make PDFs from Safari or any app with a share sheet * Get directions to the nearest coffee shop in one tap * Tweet the song you're listening to * Get all of the images on a web page * Send a message including the last screenshot you took * And so much more... Shortcuts can be launched from the Today widget, from Search or by asking Siri. You can even add an app icon to your home screen for your favorite Shortcuts. 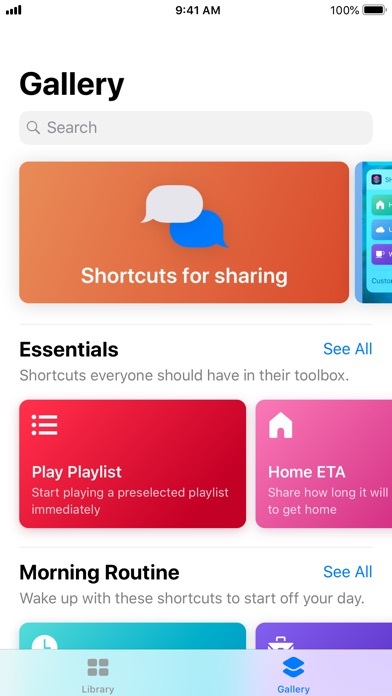 Shortcuts opens up incredible possibilities to automate things you do regularly on your iPhone and iPad. This app is very buggy, when I try to delete something from my shortcut that I am making it crashes every single time, even if I reboot my device! Can’t work like this! Good app as long as Siri has never been activated before, otherwise, it’s dead. Was using it to turn off WiFi/BT since you can’t do it from the control center anymore....but I made the mistake to activate Siri once....my mistake. I love the capabilities this enables including how it works with Siri to build a list of simple commands. The problem is, whenever I do one of these shortcuts I am left tapping away the shortcut menu or tapping to confirm the commands. In the same amount of taps it is sometimes easier to carry out an action on my own that I specifically made the shortcut for which defeats the purpose of this whole thing. There needs to be scripting commands to automatically close the app and/or bring me to the homescreen or lock the phone. Maybe an option to carry out a command without confirmation or leaving me in an app I have to close. If I tap a shortcut button from my home screen and it carries out a command why would I want to be left in the shortcut menu main page? Shortcuts are supposed to save time/taps. Don’t know why the app crashes so much. When I open the app it crashes 7/10 times. Please fix. And also some functions crashes the app. Why does Time Between Dates not work? I’m happy to change my rating if this feature worked. I want to be able to text my partner who lives a state away how many days until we see each other next. So cool . I had this idea, screamed it at my phone and they finally heard it. Hahaha jk 🤙 great app such a good idea I was tellin my friend the world needed to bring this out If u have any networking needs please email me here and maybe we can collab for free I don’t mind discounting for a feature in your next ad in exchange for a feature for my next ad I’ll be releasing my next single on Spotify in a few days . I’m on my way up . @Graphic.divi_ My work is accessible on there I have a variety of products and ideas in the works . This will help me I’m also hiring and u get $100 instant referral when I hire you, so this will be great. Exciting to see automation on iOS! Feature Requests: - Turn Do Not Disturb While Driving on and off action - Location-based triggers (cue/run shortcut when arriving or leaving a location) - Time-based triggers (cue/run shortcut at a certain time / schedule) - Find My Friends shortcut: output friend’s location, for input to use as directions or get ETA - Quick Look: rotate an image to fit screen orientation when rotating the device. - Speak Text: Use the configured system Siri voice and accent when speaking text.